So.. lesson learned, the 12v switched power source I had wired for the Stinger was switched off during cranking I fixed that fubarred decision and the CPS sync'd up nicely. I set the timing according to Shaeffs calibration sticky, and then I ran a timing light on the motor. I then popped that timing value into the s tinger stating timing field and the car fired right up. It sounded great after months of silence. i will fix two minor oil leaks now... one from the Oil pressure sensor behind 2JZ power steering and one from a leaky turbo oil return flange on the upper oil pan. Thanks to all that assisted via PM in answering some of my questions. SO I cleaned up the interior of the car, and begain working on the fog lights. I am retrofitting the ES300 light. Right now Im fabbing up some brackets to get welded tomorrow. OK so the brackets look kinda stupid but they work. 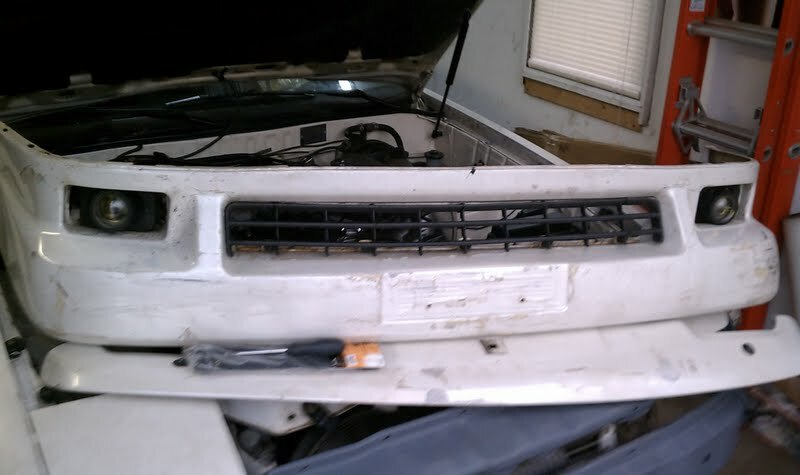 I will have to make Fog Light Filler plates for the bumper. to fill in the space by stuffing a little circle into a spot for the OEM big rectangular light. I also decided to make new bumper mounted out of a piece of 3/4" flat aluminum stock and some stainless steel nuts and bolts. after I did that I removed my OEM FMIC and emptied a can of brake cleaner into it. I taped the ends shut and sloshed it around in every possible direction to shake the oil coating and crud of 23yrs out of it. I drained it and it came out looking like used motor oil! I will use some gasoline tomorrow to get the residue out as I have the FMIC standing on its openings so all the crap can drain out. Once thats out I will give it a good pressure washing and remount the FMIC and Oil cooler. 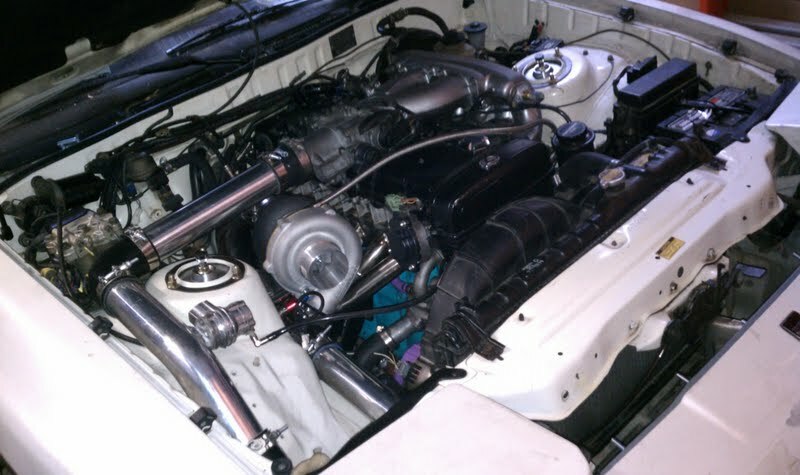 I also ordered my 2.5" piping and couplers to get my turbo all set up. That along with some decent eBay interior stuff should arrive by Friday. It's a work in progress man. You just gotta remember, things can always be improved upon later. OK, all the FMIC piping has been mocked up. It's not as low as it looks, but I may remove the OEM tow hook, and run the IC pipe a bit higher up. I had to remove both of my tow hooks to run my IC piping. I pretty much cleaned up the engine and secured all the IC piping since I have gotten most of it welded. I have the car running but the Stinger is idling at 1900-2000rpms. I do not see any obvious boost leaks so I will attempt to manipulate the TPS tomorrow. So I removed the throttle body to remove the Idle Air COntrol valve. I figured that was stuck open as most toyotas are on start up. I removed the two screws holding the IACV in place and found a 7/16" hole into the intake mani. Luckily I had a 1/4" NPT Tap and plug that fit the bill. I tapped the hole and blew out the shards with my compressor. Then I proceeded to plug the hole with the 1/4" NPT plug. After reinstalling the throttle body and loosening all the idle adjuster screws I fired up the motor again and it again started but this time it fell on its face due to no air coming in. I turned the idle set screw just a bit until it now touched the throttle wheel, then I turned it just a 1/4 turn more. The car was now fumbling at around 300-400 rpms. I turned up the idle screw until I hit around 1000rpms, them I began to tune the idle in the stinger fuel map. after about 2-3minutes, I have the car now idling at a smooth 820rpms. I will begin some street tuning later this week. Although the plan is ti eventually sell this MK3, I can not leave things half done... especially if I am going to be driving this car. I need a 100% perfect running vehicle. Dropped out the OEM gas tank to address a whiny OEM fuel pump. I will be swapping in a Walbro 255 and some -6AN braided line to the Fuel Filter. I bought about $50 in AN fittings and lines to accomplish this. 23 year old gas tank. I bought new fuel pump hanger mount screws to replce the rusty 5/16" hex bolts that have been on there forever. Im gonna wire brush and clean this hanger and prep it with the -6AN 90* bulkhead fitting and feed lines. I think I'm gonna save up and drop in a 15gallon fuel cell. Does anyone have experience with what fuel cell sender works with the stock gauge? Dropped in the Walbro255 and made the braided line adapter and fittings to the fuel pump. Reinstalled back in and car fired right up. Hit a preliminary dyno tune. 302 at 13psi. cheapo exedy stage2 clutch was slipping at 11psi. I will probably upgrade to a stronger clutch and PP for the W58. Stock SC300 injectors maxxed out at 312rwhp. I just picked up a set of 870cc injectors and a Aeromotive FPR. Gonna install that stuff and give the car a final tune. Special shout out to Aaron at Driftmotion for assisting me with some Stinger issues. Just ordered some Hellas from rallylites and a set of H4 HID's for some good visibility. The car is always for sale, the price isn't necessarily going to stay the same but I still enjoy restoring a Supra! While it's mine, I will treat it like a Supra. Ahhh first UPS delivery of 2011. I'm in the process of installing the same Tanabe exhaust onto an mk3 supra. Were you able to re-use the stock mounts or did you have to make something custom?